Cove’s Hummer 29er titanium hardtail is a long-rumored, long-awaited reintroduction of a classic North Shore hardtail aimed at aggressive technical terrain. In the early 1980s, a group of British Columbia bike nuts living in North Vancouver wanted to ride bikes. Chaz, Nummers, and Dewey started importing bike parts and bikes from California to their home in Deep Cove, and Vancouver’s first bike store was born. 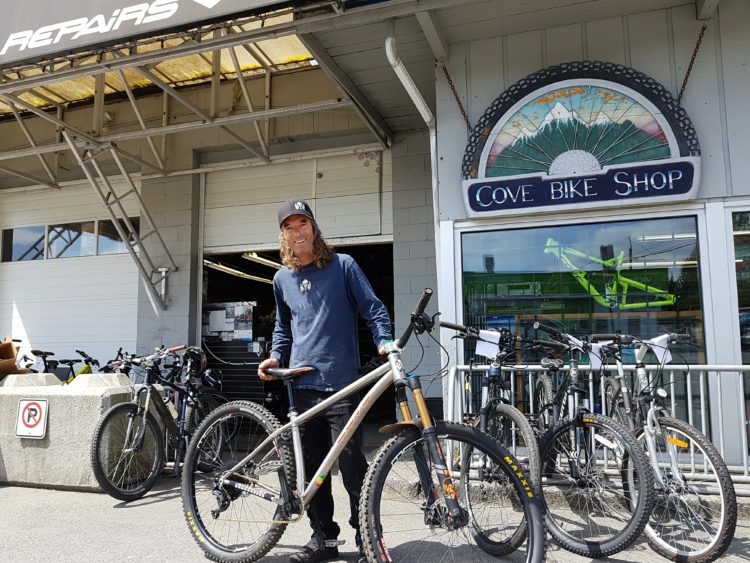 Since then Cove Bikes has set up on Main Street in North Vancouver, growing, then shrinking, then growing again. 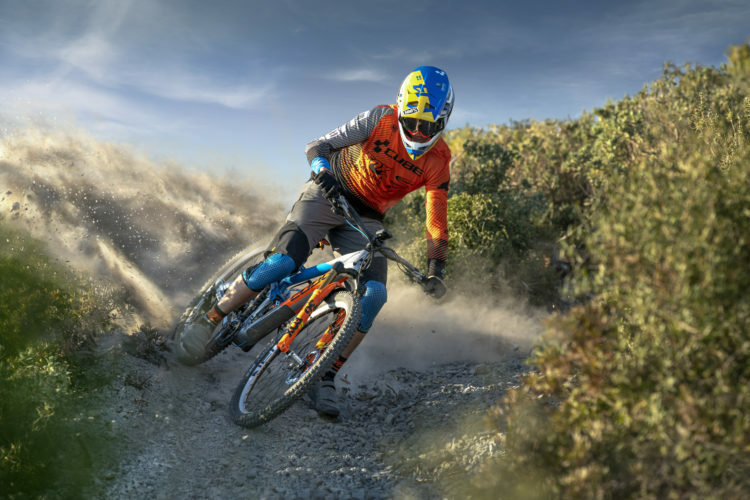 Cove has a long, checkered retail background, and they’ve also got experience with their own line of products including hardtails and dual-suspension bikes. 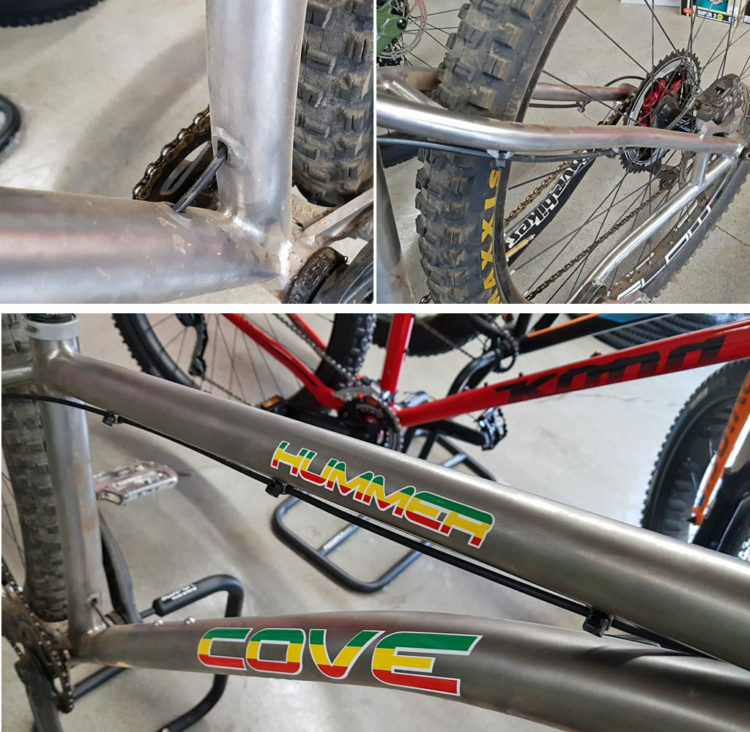 Cove’s first bike was the Hummer hardtail produced in the early 1990s. It was something of a revelation for hyper-technical riding, featuring — relatively speaking for its time — slack geometry, long top tubes, short chainstays, and a short stem. Chaz with a production Ti Hummer in size small. The Ti 29er Hummer is made by Lynksey Performance, a family-owned company based in Tennessee. This keeps frame production in North America. 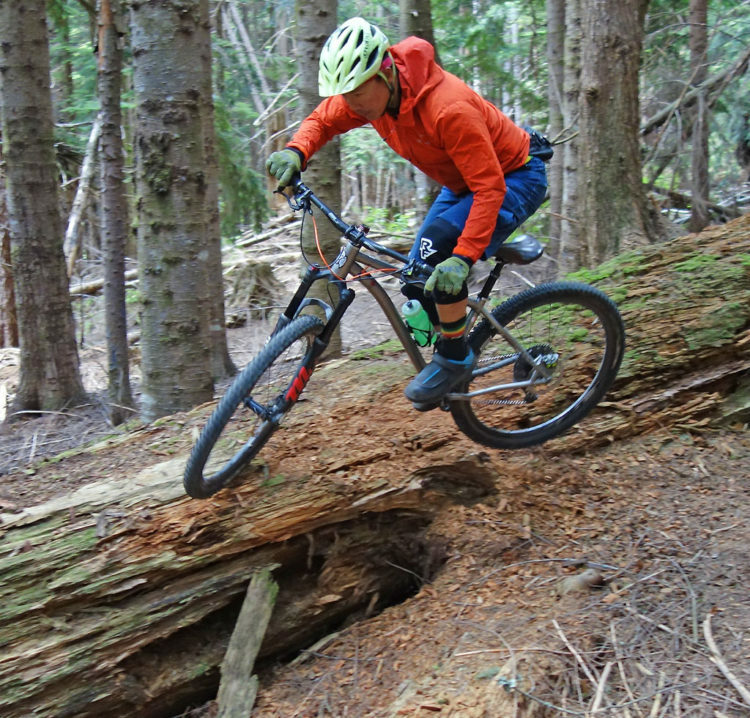 Chaz testing out the goods on C-buster, a trail first built by Cove mechanics on their days off. So why a hardtail? Some might bleat on about mystical simpleness, the elegance of a design that lacks complexity. However, I won’t sugarcoat my perspective: there aren’t that many really good objective reasons for a hardtail, given how good full suspension designs are now. 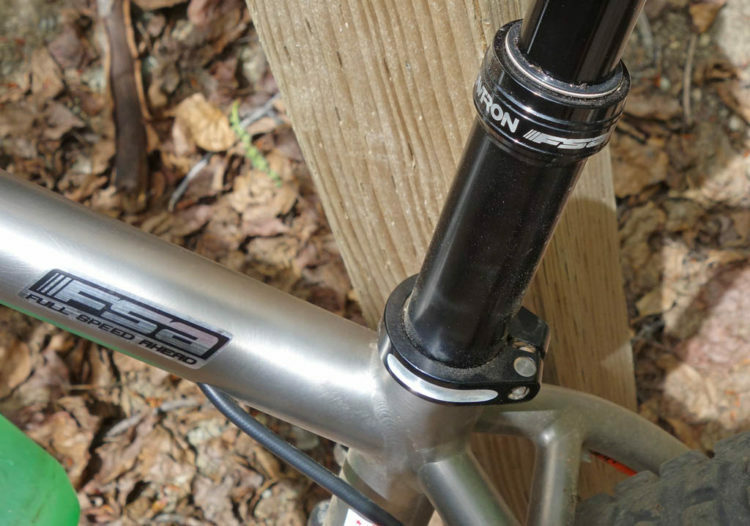 Sure, hardtails are often less expensive than full suspension bikes, but not titanium ones. 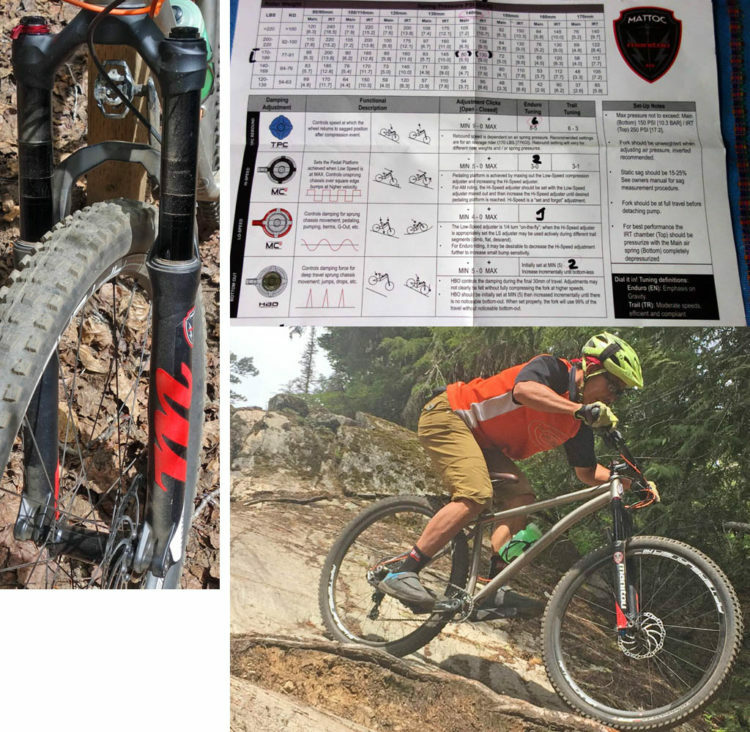 I wanted to review a Ti hardtail “because it’s there” with “it” being 29er geometry. Do you want rideable bicycle art? Do you want something you can ride for a long, long time ignoring the industry’s propensity for hara-kiri, asinine standard revisions? Then consider a titanium hardtail. 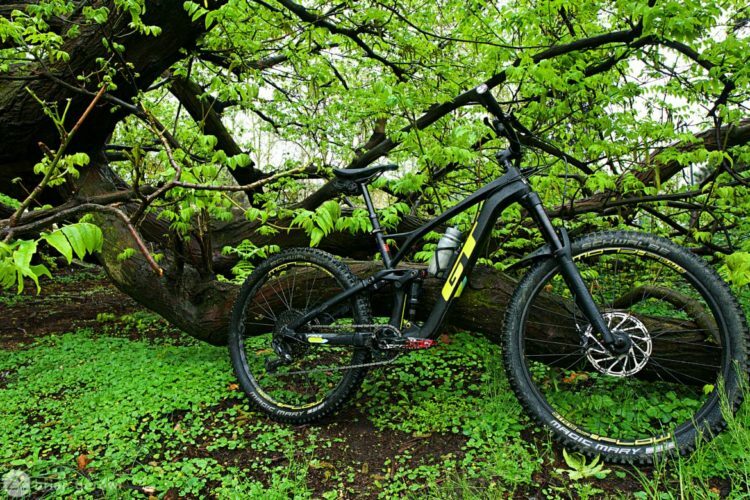 A prototype Cove Ti Hummer 29er in its natural environment slung with FSA, Manitou, and Magura components. 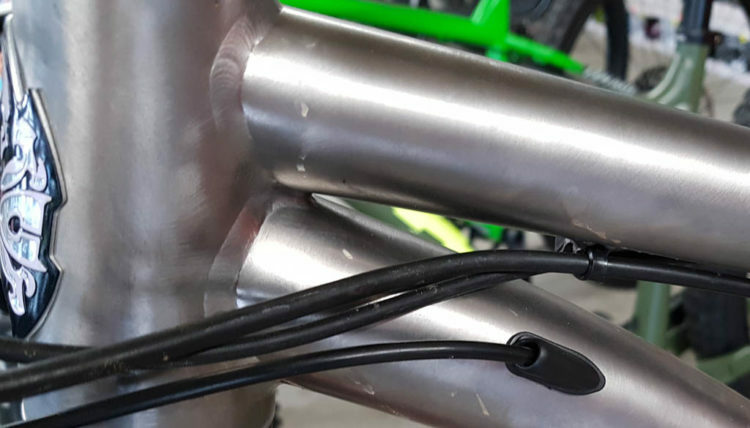 The internal brake and derailleur cable routing shown ended up being are externally routed in the production version. 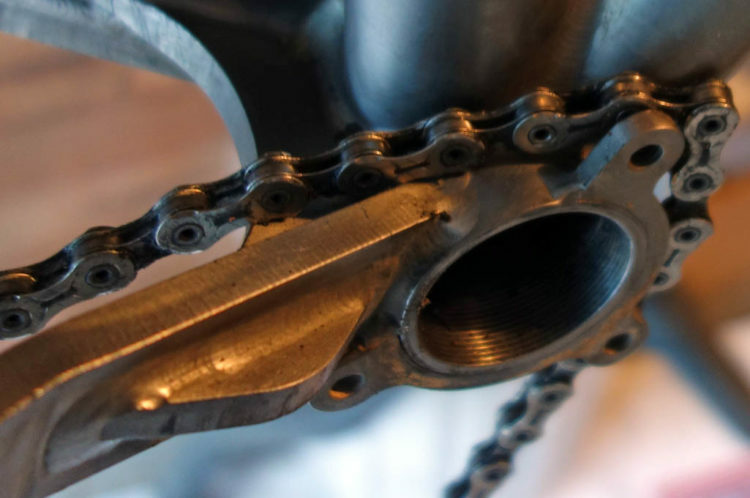 The threaded BB features an extensively machined BB area with lots of material for stiffness. ISCG05 mounts are included on all frame sizes. The Cove Hummer is presented in three sizes – small, medium, and large. The prototype featured here is a medium. The bike is sold as a frame-only for $3,100CAD (roughly $2,400USD). The small frame weighs 1.8kg/4lbs while the medium weighs 1.95kg/4.3lbs. Looking at the geometry chart below, it’s worth noting the bike is designed for 150mm suspension fork up front to pair with the slack 66° head tube angle. A production, size small Hummer Ti 29er. Only one set of water bottle bosses will fit in the small frame. Medium and large frames will have two sets of bosses and will also share the same external brake cable routing. Lots of space for meaty rear tires. Pictured with 2.3″ Specialized Butchers, but 2.6″ Butchers fit easily. The Hummer Ti rear stays will only clear up to 27.5 x 2.6″ tires so the frame is NOT plus-size compatible. Cove Hummer Ti 29 geometry. For the purposes of this review, I selected a build with a mix of Manitou, FSA, and Magura components. On hearing this someone said to me, “that’s very 90s.” I had just finished watching The Moment, so it occurred to me that this was a hearty compliment. Plenty of good things happened in the 90s — and not just the Smashing Pumpkins. Back then, bikes were simple and tough. They had to be to survive what we did to them as we explored the limits of trail building and riding. With that in mind, I chose components for the Cove Hummer Ti that are reliable, offer a good value, and can handle abuse. My heavier build on this Hummer with stock FSA alloy Afterburner wheels and Specialized Grid Butcher 2.3 tires weighs 12.3kg (27.1 lbs.). With the more blingy FSA SL-K carbon wheels and lighter Specialized Control Purgatory and Slaughter 2.2″ tires, I got the weight down to 11.8kg (26lbs.). Cove does offers build kits, but buyers are also invited to get a frame-only and provide your own build kit. 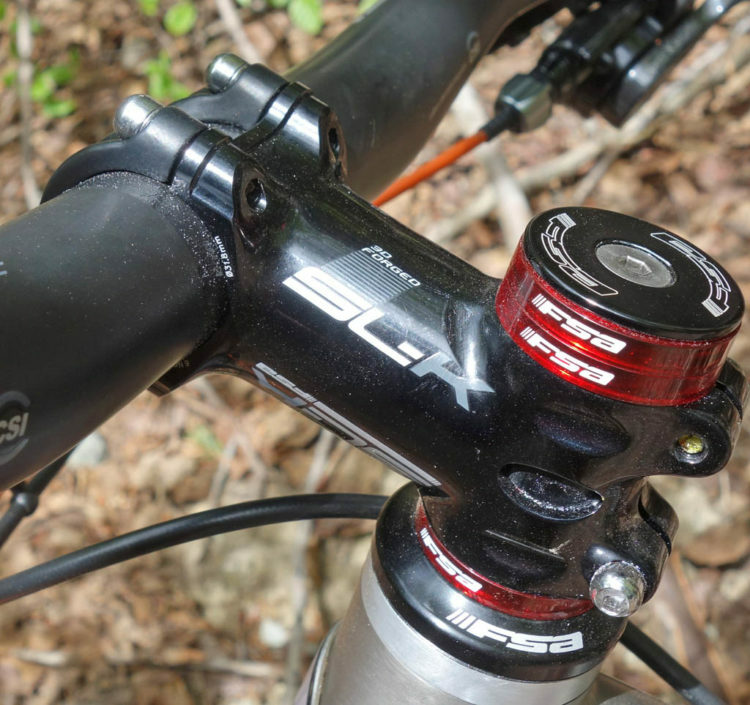 FSA SL-K stem. FSA Orbit headset. 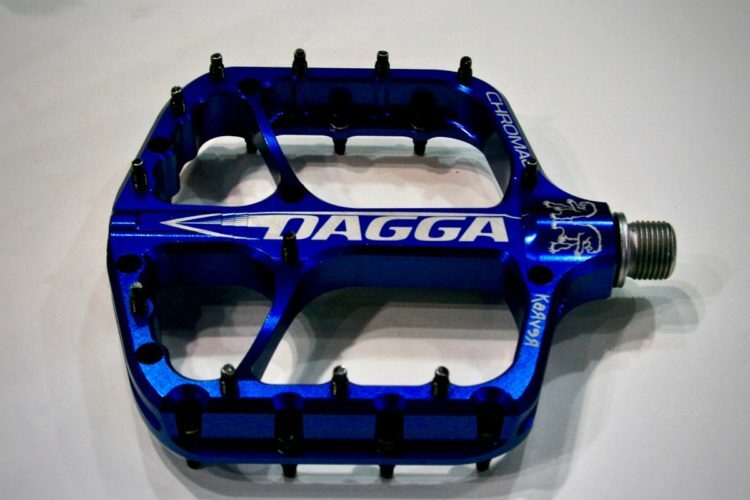 FSA handlebar. I found the SL-K stem to a tad long so I’ve been keeping it classic by experimenting with a Syncros 50mm stem. FSA SL-K carbon Boost wheels with 24, straight pull spokes for added compliance yet lateral rigidity. The Manitou Mattoc has a bewildering amount of settings available using the Dorado DH cartridge platform, including low-speed compression damping; high-speed compression damping; hydraulic bottom out; rebound damping; beginning-stroke air pressure; and middle/end-stroke air pressure. 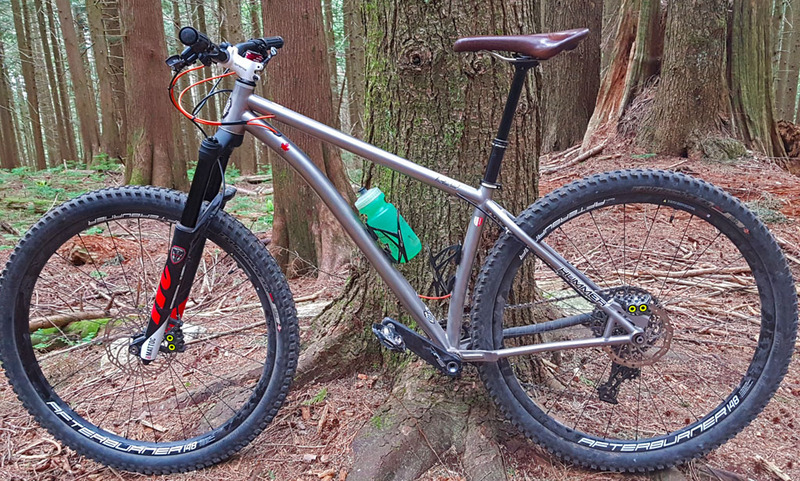 Yes, that would an easy a review, but it does bikes like the Cove Hummer a disservice. 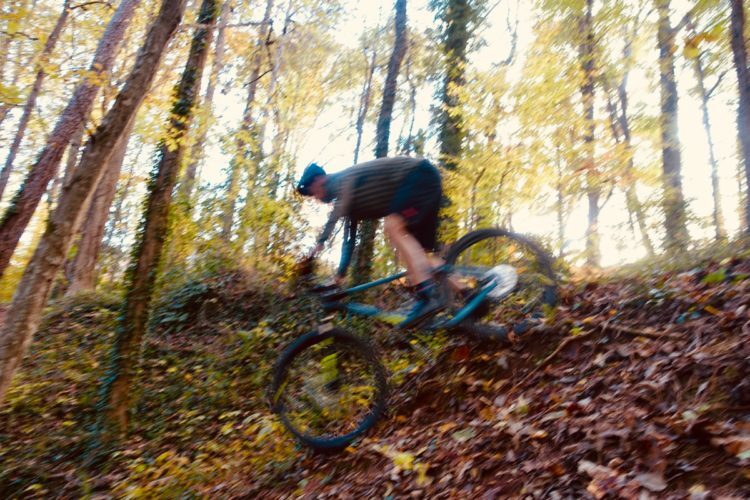 The elusive joy of the hardtail is defined by the experience of being able to be precise; to pause on a steep technical downhill to reassess and adjust the trajectory; to lunge and ratchet through rocks and roots; and to move the back end around on tight terrain. Certainly, hardtails are not for everyone. And most definitely this doubly, triply, applies to titanium hardtails. Those who lust after a Ti hardtail probably have another bike or three, and also have a bag full of riding skills. Titanium is a singularly strong material which can be drawn into tubing then welded into shapes to customize the ride feel. 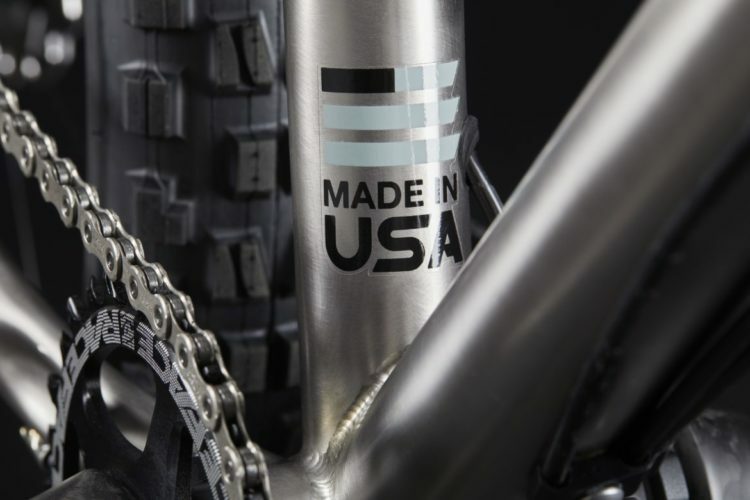 Given the price of a Ti hardtail, buyers want not only long-lasting quality but also a balance between compliance and precision. After spending some 40+ days on the Cove Ti Hummer 29er, I would say that this bike has achieved just the right balance. I started with a light FSA-SLK carbon wheelset on the bike, which was a mistake. The bike climbed and accelerated like a goat on paved and gravel roads, but skinny rims and tires make for sub-par performance on the tech. If you primarily ride on smooth, non-technical trails then go for the lightweight build. Trading off for a slightly heavier (but still light by most standards) FSA Afterburner alloy wheelset and medium-weight tires made the Ti Hummer 29er much more capable. 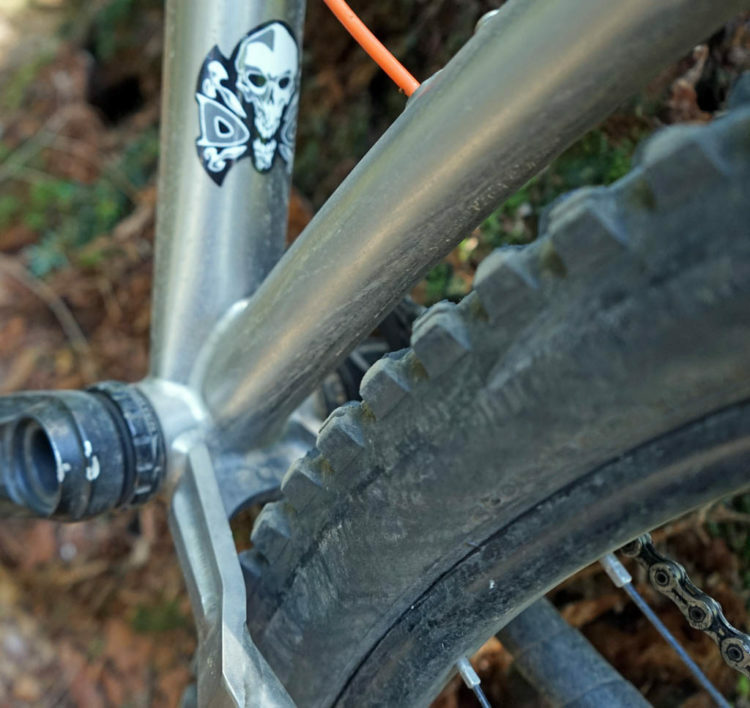 With a Maxxis Minion DHF/DHR tire combo on the Ti Hummer 29er, the bike became a trail slayer. Chaz on C-Buster on a tight technical log ride. 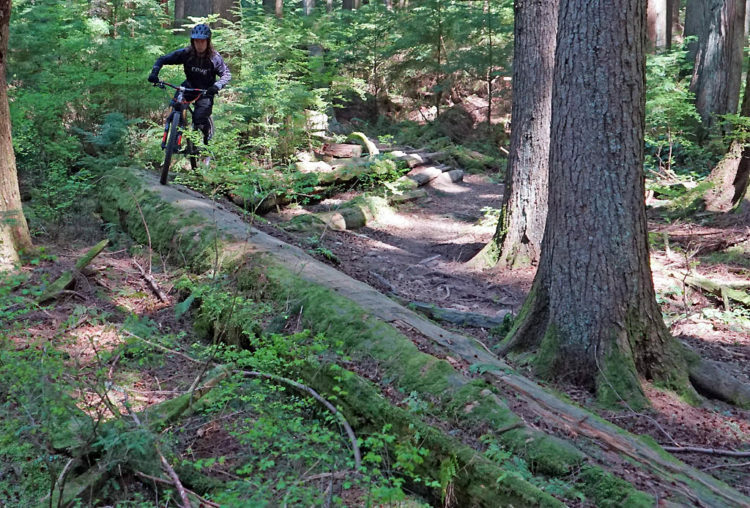 There’s no way around it: riding a hardtail requires precision. And no amount of miracle titanium give or springiness will waive that requirement. Loose, rocky, rooty climbs are never pleasant, and that’s definitely true more so on a hardtail. Delicacy and finesse is what you need for technical climbs when you lack properly-designed rear suspension. Conversely, where the hardtail shines is when you need to accelerate; to put power down quickly. The Cove Hummer 29er is stiff enough that there’s instant feedback. Lunge, ratchet, or accelerate and your power comes on instantly. This is perfect for timing technical sections and cleaning them. However, the benefit of responsiveness for short sections is more than offset by how much a hardtail gets bounced around on the tech. Lee on High Society in Whistler. 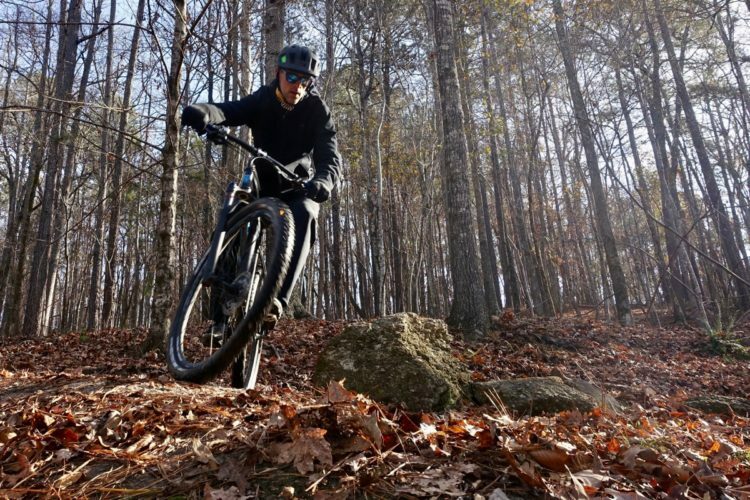 Given the tradeoffs associated with hardtail mountain bikes vs. full suspension bikes, I was pleasantly surprised to find how capable the Cove Ti Hummer 29er is on the descents. The 29er wheel, with its massive ability to carry momentum and roll over tech, has been a boon to hardtails. 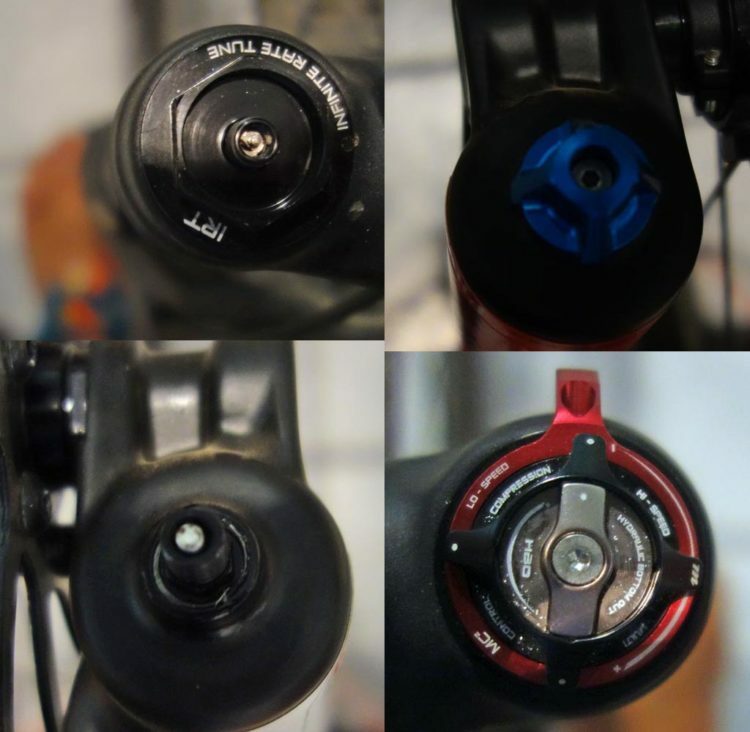 Moreover, mountain bike geometry has come a long way. Combine the two, bake in the miracle metal titanium, and the combination is astounding in its versatility. At the outset it’s worth noting that it took a while for me to learn how to ride the bike. And I believe that to be independent of the frame material and more to do with having confidence in the 29er wheel’s ability to carry momentum through technical terrain, whether that’s steeps, rocks, or roots. One learns (or in my case re-learns) how to corner, steer, jump, and plow differently. One massive benefit of bigger tires, of course, is the added give when things get a bit hairy. 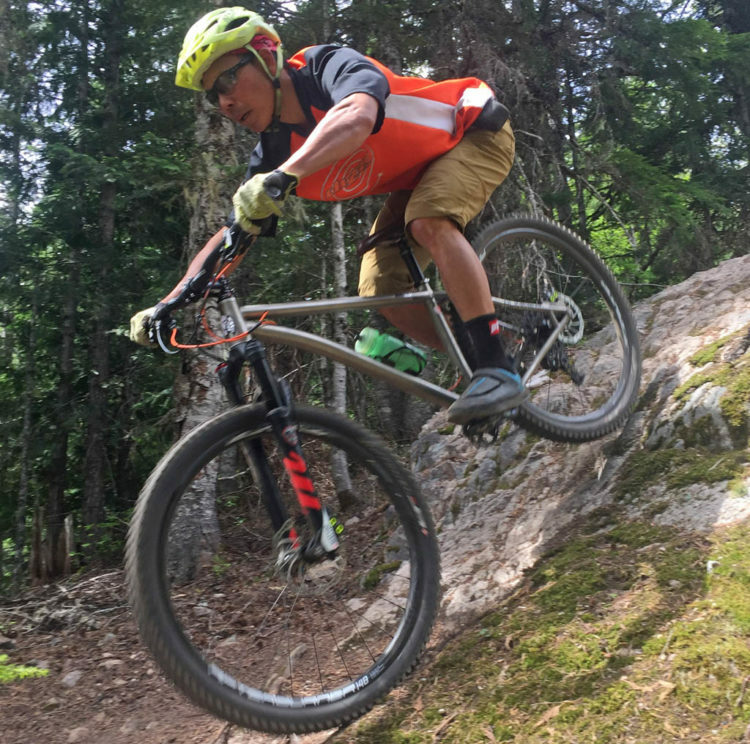 While hardtail mountain bikes are precision instruments, sadly this rider does not possess the same laser-like precision. The bigger tires, the wheel size, and the (slight) give of titanium all adds to the ability to carry speed and tackle steep slopes that I would not have expected out of a bike without rear suspension. The Cove Ti Hummer 29er is simply outstanding on tight, slow, technical trails. Coincidentally these are the kinds of trails I build, maintain, and love to ride. 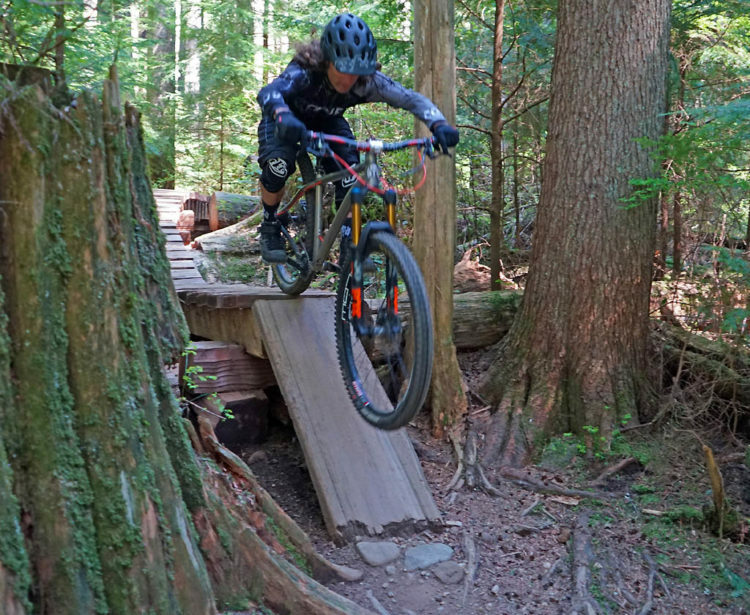 There’s no shortage of these types of trails in the Vancouver – Squamish – Whistler corridor, and I would imagine that many people considering a hardtail will find the joy of precise response in whatever slow, technical, janky trails they might have. Need to pop a wheelie to drop a flat jump? Need to move your back end around to get from one obstacle to another? Need to ratchet and lunge for an up-and-over move? Need to do a front-wheel endo to get around a tight corner? The Cove Ti Hummer 29er offers that instant magical control letting the rider set up, catch a split-second, and then make the move. If your network isn’t that technical and your trails are more of the fast, loose chunky variety, then I question whether any hardtail makes sense (other than for N+1). 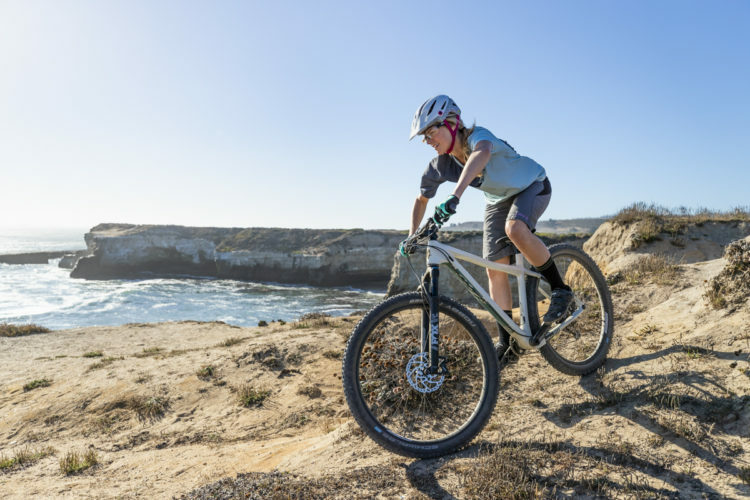 Waxing rhapsodic about the miracle properties of titanium or the 29er wheel aside, you’re going to give up control at speed on the Cove Ti Hummer 29er. If you’re looking to get down the mountain from A to B as fast as possible, this isn’t the bike for you. Conversely if your journey involves doubling up roots, playing on skinnies, riding unnecessary lines, going sideways for the hell of it, or just generally getting loose then perhaps this is the bike for you. 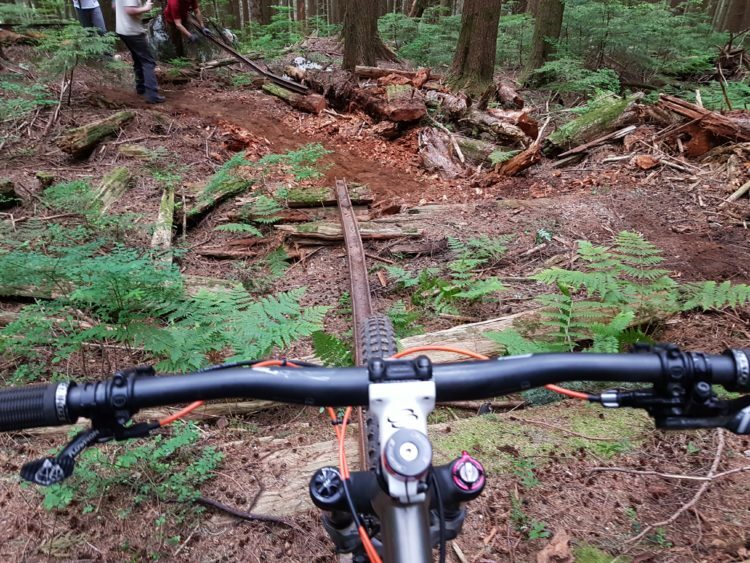 Messing around with a natural log ride – Vancouver. 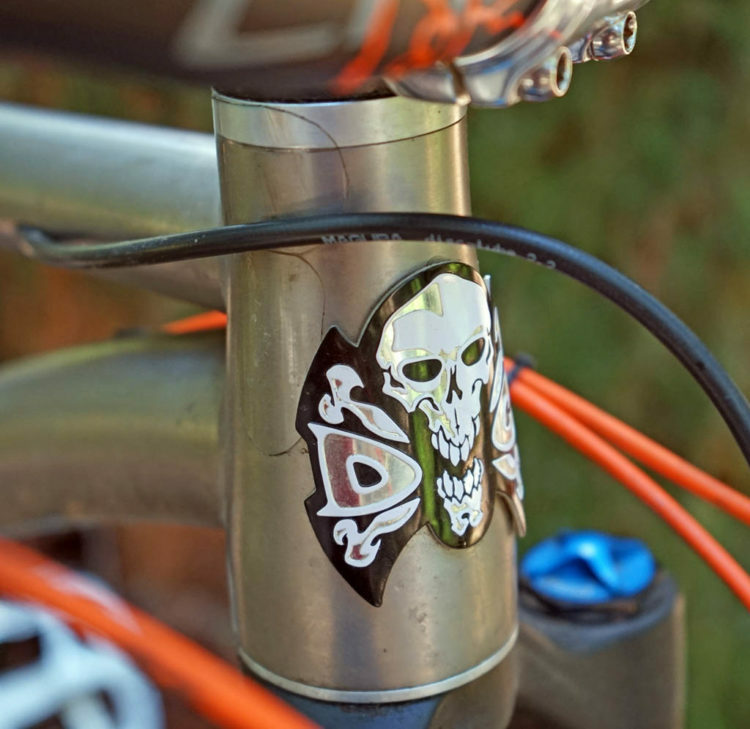 The bottom line is that the Cove Ti Hummer 29er does go up and down like a hardtail. You will get bounced around unless you take the time and effort to figure out how to not get bounced around. If you value precision in how you ride versus speed and/or simply blasting through things you will enjoy this bike. 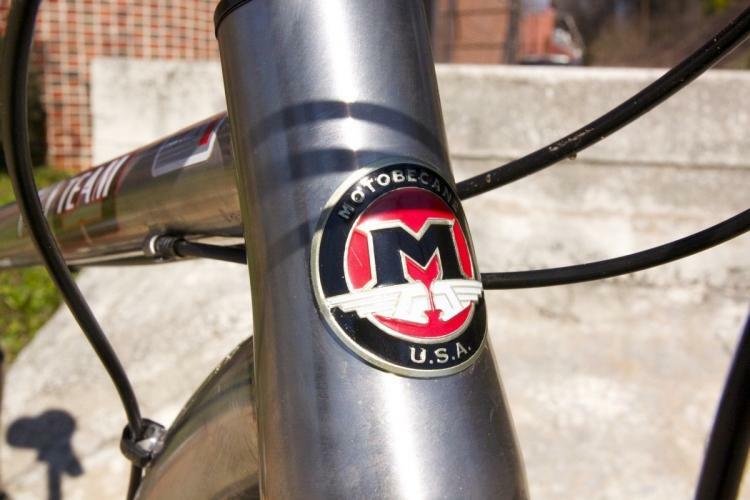 If you are a bike nerd who loves beautiful things and you happen to be able to ride, then you will love this bike too.